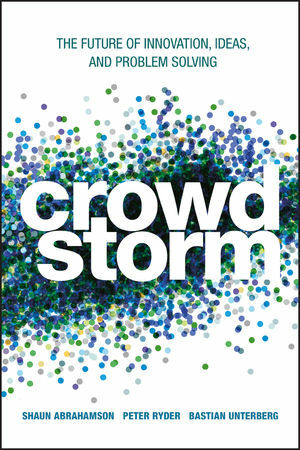 Our goal is to help our readers make Crowdstorming work; to help more organizations engage with people far beyond their organizational borders, to find better ideas, solutions, talent and partners so we can address some of our most challenging problems -- not just for the sake of business, but for our society, too. Shaun Abrahamson is an early stage investor and advisor. For the last decade, he has worked with some of today's leading startups. At Mutopo, he advises global firms on how to benefit from online connections with customers and experts. He built computer-aided design tools at MIT, studied at the Berlin School of Creative Leadership, lectured at the Wharton School and New York University, and contributed to the Economist Intelligence Unit. Peter Ryder is the former president of jovoto, Inc., a startup whose platform and community help companies innovate and solve challenges facing their business. After a successful career in consulting at Deloitte, CSC, and Accenture helping organizations use technology to transform their operations, he now invests in new ventures and advises organizations on how to take advantage of new technologies in today's digital economy. Bastian Unterberg is the founder and CEO of jovoto, a Berlin- and NYC-based firm that organizes a 40,000-person strong creative community to work with global brands on problems ranging from new product design to sustainable architecture. His work has been featured in various media such as Page, New York Times, Focus, and Fast Company. An active speaker, Bastian presents at various national and international conferences.